On .9 acres this 6 room 3 bedroom 2 bathroom home with a 2 car garage, is a one of a kind immaculate custom built contemporary waterfront ranch offering comfortable living at it's best. Nice and bright living room with cathedral ceilings, fireplace, wood stove, sliding doors to the patio overlooking the docks and waterfront. Nicely designed kitchen with Jenn Air grill cook top and Jenn Air built in microwave and convection oven. Master suite with bath. Whirlpool tub in second bath. 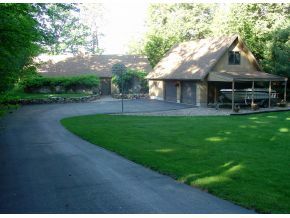 Attached two and one half car garage with unique underground hallway connecting the main house. Many extras...listing agent Bill Grigg, Maxfield Real Estate, for more information on this home call Lady of the Lake Realty at 888-737-5550 or our website for similar lake listings. 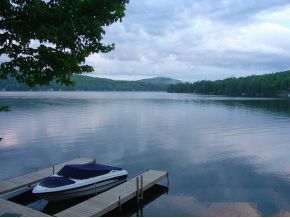 Merrymeeting Lake is a 1200 acre spring fed glacial lake.